This month’s Friends n Neighbors Stamp Club was a swell chance to get together with everyone before school started up again to make some cards. In addition to the Chalk Talk card (using the Chalk Talk Stamp Set, coordinating Chalk Talk Framelit Die, see my last blog), we also had time to make cards with the new Kind & Cozy Stamp Set. The tiny tea cup is just perfect! 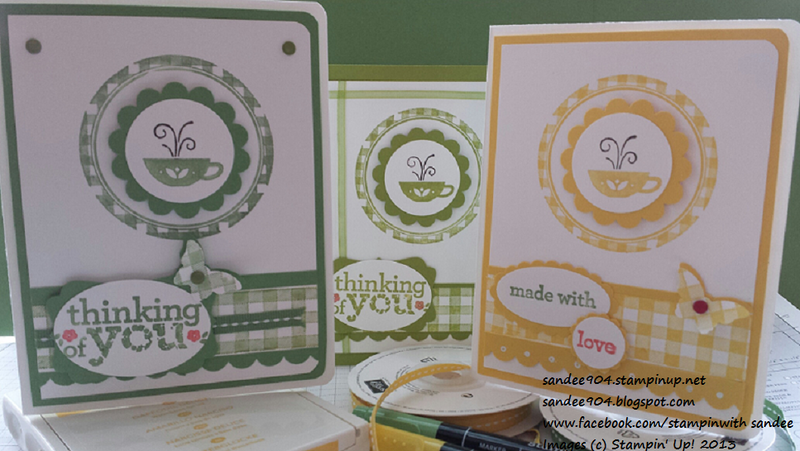 This set incorporates the gingham pattern so great to again be able to use the Gingham Stampin’ Around Wheel. I love it when everything coordinates! This stamp set has everything to make a simple card and (with a little butterfly punched out of gingham “wheeled” paper, candy dots or ribbon) easy to bling. You might consider adding the Kind & Cozy Stamp Set and Gingham Stampin’ Around Wheel to your collection! Check back soon for an update on September’s cards where we will focus on our Halloween cards and treats! Quickly coming to an end – The Paper Pumpkin promotion ends on August 31. Now don’t get upset, you can still join Paper Pumpkin after August 31, it is just the discount that will end. Please contact me for more information! 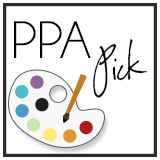 Pick a Kit Recruiting Offer ends on August 31 – New recruits get to pick one of four project kits for free in addition to their starter kit when they join Stampin' Up! Please contact me for more information! I would LUV for you to join my team. 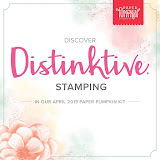 Don’t forget that if you can update your Stampin' Write Markers collection with any individual colors you are missing or ALL of the new colors for a limited time. (Contact me for the item numbers) This offer ends October 31, 2013. The entire markers kit can be found on page 163 of the Annual Catalog (item 130034). Released August 15 – A brand-new photopolymer stamp set is now available. Another Thank You (item 133454) is an exclusive, versatile set for any occasion that calls for a thank you. Updated August 14 – A new, holiday-themed collection of single stamps is now available! The holidays will be here before you know it, and these holiday-themed single stamps may be just what the budget-conscious stamper needs. There are eight different stamps to choose from, six of which coordinate with Framelits dies or punches. Released August 1 – The Holiday catalog is here!! If you placed an order from me in the last 6 months, your copy is on its way. (Please let me know if you haven’t received it yet!) And, if you would like a catalog, I will send you one without charge if you purchase $25 or more any time before the catalog's expiration (or before they are no longer available for purchase). Released August 1 – Best of 25 Years Stamp Set - Best of Halloween. Super spooky, right. (Item #134381 clear mount $14.95).